A heat pipe uses a closed two-phase fluid-flow cycle to transport large quantities of heat from one location to another without the use of electrical power. The heat pipe can be used to create isothermal surfaces or to spread out heat from a localized source uniformly over a larger area. One-way (diode) heat pipes have been tested and flown, as have variable-conductance heat pipes, which maintain a constant temperature under varying heat load conditions. Since the driving mechanism is capillary pumping, a relatively weak force, traditional heat pipes may be susceptible to severe performance degradation when operating under gravity or acceleration, so planning is needed to facilitate ground testing. Loop heat pipes and capillary pumped loops are more advanced cousins of the basic heat pipes that can provide constant temperature operation with varying heat loads under gravity or acceleration. To illustrate how a heat pipe works, consider a simple horizontal heat pipe in equilibrium with an isothermal environment, as shown in Fig. 11-22A. The liquid in the wick and the vapor in the vapor space are at saturation. If heat is applied to the evaporator, raising its temperature, liquid in the wick evaporates (removing some of the added heat), which depresses the meniscus in the evaporator since less liquid is present there. This process also raises the local vapor pressure, since it must be in saturation with the heated liquid in the wick. Pig, 11-22A. Heat Pipe Schematic. Heat pipes are very efficient in moving heat from one-place to another on the spacecraft See text for a description of operation. lary pressure sufficient to pull liquid from the condenser wick toward the evaporator. This replenishes the liquid in the evaporator wick. At the same time, heated vapor flows from the evaporator to the condenser, which is at a lower pressure. When this vapor comes in contact with cooler condenser surfaces, it condenses. This cycle is shown schematically in Fig. 11-22A. Elements of this most basic, constant-conductance, heat pipe consist of a working fluid, a wick structure, and an envelope. The most common wick envelope design consists of axial grooves in the wall of extruded aluminum tubing, as shown in Fig. 11-22B. This class of wick is very susceptible to gravity effects during ground testing, but is relatively inexpensive to produce and very consistent. Heat-transfer capability is moderate, but sufficient for many applications. 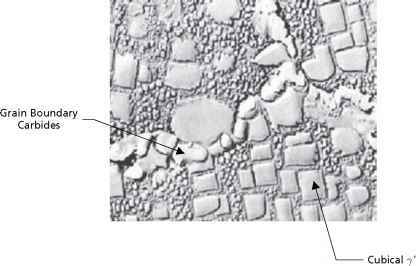 Grooves are typically rectangular or trapezoidal in shape, but more complex shapes such as the "teardrop" or "keyhole" have been extruded with difficulty. Different working fluids can be used depending on the temperature range of interest. In most spacecraft applications, ammonia is the working fluid of choice. Laptop computers, on the other hand, typically use Water in heat pipes used to cool high-power chips. Fig. 11-22B. Grooved Heat Pipe. This is an example of the most common wick/envelope design which consists of axial grooves In the wall of extruded aluminum tubing. The most obvious application of a heat pipe is one requiring physical separation of the heat source and sink. If a heat pipe is used, it is not necessary to mount all hardware to be cooled directly on radiator panels, or to use relatively inefficient conductive couplings. A closely-related class of application is that of the thermal transformer. A small high-powered box can be mounted on one side of a radiator with integral heat pipes; the heat generated will be spread out over a large radiator surface. This approach also permits more efficient use of available "real estate"—the area available for a radiator is seldom centered symmetrically about the heat source, facing the optimal direction. Heat pipes have also been used to reduce temperature gradients in structures to minimize thermal distortion. The telescope tube of the Orbiting Astronomical Observatory had three ring-shaped heat pipes to minimize circumferential temperature gradients. The ammonia/aluminum heat pipes worked throughout the eight years of mission life. The diode heat pipe was first proposed as a means of connecting a device to two radiator panels on opposite sides of a spacecraft, with the understanding that at least one of the radiators would be free of any direct solar load at all times during the orbit The diodes would couple the device to the cold radiator, while preventing heat from leaking back into the system from the radiator in the Sun. This type of thermal design problem—in which heat from a temporarily warm radiator or from a failed refrigerator must be kept from leaking back into the system—is an obvious application for a diode heat pipe. The variable-conductance heat pipe can be used to control the amount of active radiator area, providing reasonably good temperature control without the use of heaters. This is particularly attractive if electrical power is limited, and this type of design has been flown on a number of satellites. However, if the application requires maintaining a component at virtually a constant temperature, feedback control (at the expense of some heater power) may be employed. A sensor on the baseplate of the device to be controlled can be routed to an on-board computer, and whenever the temperature drops below the desirable range, heaters on the variable conductance heat pipe reservoirs are activated, causing the control gas to expand and block off more of the radiator area. If the temperature rises above the range desired, power to the reservoir heaters is reduced, increasing the active radiator area. This concept usually requires less power than using heaters directly on the box or system to be controlled. • Special thermal control requirements for components such as batteries, crystal oscillators, and sensors. Once specific design requirements have been identified, the thermal design development process illustrated in Fig. 11-23A begins. This process is a combination of design selection and supporting analysis. The selection of a viable thermal design approach may become almost intuitive for an experienced thermal engineer. Detailed thermal analyses are, however, always required to verify and refine the design. Experience can minimizes the number of time-consuming analysis iterations required to close in on a final design. Establishing a preliminary thermal design for the spacecraft is usually a two-part process. The first is to select a thermal design for the body, or basic enclosures of the spacecraft, that will serve as a thermal sink for all of the internal components. The second step is to select thermal designs for various components located both within and outside of the spacecraft body. As shown in Fig. 11-23B, we begin by assuming that a passive design will successfully meet all thermal control requirements. As discussed earlier, a wide range of thermal control hardware and techniques are available to achieve thermal control, from simple surface finishes to complex heat transfer and refrigeration systems. The spacecraft system requirements to minimize weight, cost, and test complexity while maximizing reliability are usually served best by keeping the thermal design as simple as possible and by avoiding the use of active components. A design that relies only on surface finishes and insulation blankets will be lighter, far less expensive to build, more reliable, and easier to test than a design involving heat pipes, louvers, or refrigerators. Therefore, although active components will sometimes be required, they should be used only when necessary. Most three-axis stabilized spacecraft use the same basic approach to thermal control of the spacecraft body, e.g., insulating the spacecraft from the space environment with multi-layer insulation blankets and providing radiator areas with low solar absorptance and high infrared emittance to reject waste heat High-power components are usually mounted on the walls of the vehicle, which provides them with a direct conduction path to the radiating surfaces on the outside. If component powers are high enough, conductive doublers or heat pipes may be required to spread heat out over a wider area so that it can be radiated away at a reasonable temperature. Components mounted on shelves, panels, and structures internal to the vehicle radiate their waste heat to the outside walls of the spacecraft, where the heat is rejected to space. The overall thermal balance of such a spacecraft is shown in Fig. 11-24. Fig. 11-23A. 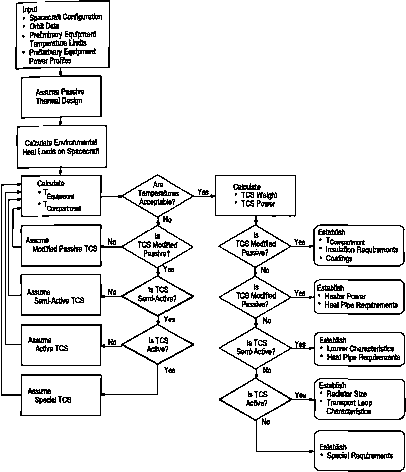 Typical Thermal Requirements Flow-Down. 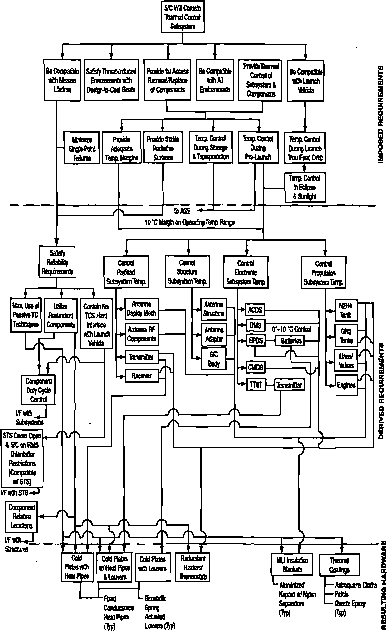 Here you can see the general flow down from Imposed requirements to derived requirements and the resulting hardware Implementation. math model for predicting temperatures. The geometric model is a mathematical representation of the physical surfaces of the satellite or component and is used to calculate the radiation couplings between all surfaces in the model, as well as heating rates to each surface from externa] flux sources such as solar, Earth IR, and albedo radiation. The thermal model is usually a lumped-parameter representation of the thermal capacitance of each node and thermal conduction terms between nodes, and is direcdy analogous to an electrical RC network. These models are constructed using a combination of computer-aided design technologies and hand calculations. Fig. 11-24. Thermal Design Approach for Typical 3-axis Spacecraft Most three-axis stabilized spacecraft use an approach shown to control the thermal performance of the spacecraft body. Typically, we insulate the spacecraft from the space environment with multi-layer insulation (MU) and provide radiator areas with low solar ab-sorptance and high Infrared omittance to reject unwanted heat required to determine what exactly is the worst-case combination of factors, such as orbit Sun angle, operating mode, vehicle attitude, or surface properties. A number of parametric runs may also be required to ciose-in on optimum sizing of radiators. If the purely passive design is found to be inadequate, we repeat the process using thermal control hardware elements that are increasingly active in nature, as illustrated in Fig. 11-23B. Once a satisfactory design is found, estimates of thermal control subsystem weight and power are made and each thermal control hardware element is specified in detail. The simplest thermal control scenario is to mount dissipative components direcdy on the inner surface of the spacecraft external structural panels. Some, or all, of the external surface of the panel is used to radiate the heat load to space. Local heat loads into the panel are spread over the panel area via conduction through the panel. In higher heat flux situations, thicker facesheets or doubler plates may be needed. In extreme cases, heat pipes can be used to spread the heat load and isothermalize the radiator or maximize radiator efficiency. As spacecraft pack density increases, eventually not all components can be mounted to these panels and some will need to be located internally, away from the radiator panels. For lower power boxes, a radiative view to the spacecraft core or external radiators may provide sufficient heat transfer to maintain operating temperatures. In more extreme cases, efficient heat transport devices, such as heat pipes, will be needed to maintain operational temperatures of these components. • Batteries typically require cooler operating temperatures and smaller temperature ranges than electronic components. For example, nickel-hydrogen batteries require minimal temperature differences between each cell and also within the cell for efficient charging, which leads to symmetric cell packaging. The heater control approach usually necessitates electronic controllers to minimize cell-to-cell temperature differences. • External Mechanisms are located outside of the spacecraft where thermal environments are much more extreme. Careful consideration must be given to understanding the hot and cold scenarios. • Optical Elements generally don't like large cold temperature excursions due to coefficient of expansion mismatch between the optical element glass and the mounting substrate. For a complicated optical system, with numerous optical surfaces distributed over an optical bench, bulk temperature control of the bench may be necessary to maintain end-to-end alignment of the optical path. Cold conditions may over-stress the mounting system due to coefficient of expansion mismatch between the optic and mounting surface leading to cracked optics. In addition, any optical bench (instrument or spacecraft) generally requires thermal isolation from components mounted to it to minimize thermal distortion. • Lasers are typically a large heat source, requiring stable temperature control that may need to be temperature tuned to the flight models, so adjustable control should be utilized. This could require electronic controllers. • Passive Radiators are based on the normal principle of radiative heat rejection to space; however, they must be shielded from even small environmental heat loads, like Earth albedo and planetary IR, to be effective. Still, they are limited to the upper cryogenic range. Material selection is critical to prevent parasitic^ heat leaks via conduction. Multiple stage radiators remove these parasitic heat inputs and the final, coldest stage provides the actual sink for the detector. • Stored Cryogens are a passive, expendable fluid or gas is used to absorb waste heat, usually from IR detectors. These systems are relatively cheap and reliable, however, usually only viable for short or infrequent usage due to mass and volume constraints in packaging the cryogen. • Refrigerator Systems are active systems that use electrical power to remove heat over long durations. Vibration, cooling, and longevity issues must be addressed with these systems. Many times, the packaging of a particular electronics component yields a relatively high power per unit area of the component's footprint dimensions, thus limiting the transfer of the heat into the radiator panel. During the radiator area assessment in the hot scenario, if the required area is somewhat greater than the footprint dimensions, the heat can be spread over the required area if the panel facesheet is locally thickened under the component In extreme situations, the required thickness may increase to a point where a better spreading device is needed to minimize mass impact. Heat pipes are typically used in this situation where their large heat transport capability can readily spread the heat from a large local heat source over a larger area of radiator panel. A drawback to these devices is that they must be arranged to allow operation during ground testing. This usually requires them to be level, or a slightly adverse tilt (evaporator < 0.02 cm above condenser) due to their low pumping pressure from small differences in capillary forces inside the pipe. In certain situations, a pipe that is vertical in ground testing can still be utilized, although the heat transfer capacity will be significantly reduced. These are considered passive devices since no feedback control is needed. However, it must be understood that they will operate in the cold scenario as well, resulting in more heater power to maintain component temperatures. A successful thermal design must include adequate radiator area to accommodate the maximum operational power during the hottest operational environment without exceeding allowable temperatures. Heater power may be required to maintain minimum allowable temperatures during nominal operations, especially for propulsion components and batteries. Most spacecraft also require "survival" heaters to survive potential reduced-power conditions, although component temperature allowables may be much lower than in operational cases. Over the lifetime of a typical mission, variations in thermal environments and internal power dissipation combined with degradation of material properties can result in a large number of possible thermal scenarios. Early in the conceptual design phase, it is essential that the hot and cold extremes of these scenarios be identified, including variations in the operating condition of the spacecraft. • Low-Earth Orbit (LEO) missions are usually between 400 and 800 km altitude. Low-inclination orbits at these altitudes have eclipse periods that are fairly consistent over the life of the mission. Most Sun-synchronous missions have fairly constant eclipse periods and a smaller range of Sun angles to contend with, and have a "cold side" of the spacecraft that is never in direct sunlight. High inclination, non-synchronous missions have a full range of Sun angles, and may have weeks or months with no eclipses. Albedo and Earth infrared inputs (see Table 11-45A and Sec. 11.5.1) are significant contributors to energy balance for LEO satellites. • Geostationary (GEO) missions generally maintain constant attitude for observation or communication. The ± 23.5° angular north-south motion of the Sun during the year results in some solar input on the north and south facing sides of the spacecraft, except during the equinoxes. Equinox is normally the cold scenario for such a mission, with an eclipse season of about 3 weeks with daily eclipses up to 72 minutes, and minimal solar flux on the north and south sides during daylight. Usually, the other four sides (Earth, zenith, east, and west) experience 12 consecutive hours of Sun per 24-hour orbit, and would be much less efficient radiator surfaces due to this variability. While on station, albedo and Earth infrared radiation amount to about 1% of low-Earth orbit values, so they can be neglected for most applications. • High Earth Orbits can be highly eccentric with perigee as low as a few hundred kilometers, but the apogee may be many thousands of kilometers. Thermal environments vary accordingly; at perigee, the albedo and IR are greatest, and at apogee, only direct solar is significant for most cases. If cryogenic systems are employed, the small Earth induced heating contributions must be assessed. • Interplanetary Missions can have considerable variation in solar flux, which varies inversely with the square of the distance from the Sun. For example, the Cassini mission to Saturn had a Venus flyby, so its solar constant varied from about 2700 W/m2 at Venus to 15 W/m2 at Saturn. Decreasing solar intensity presents a huge challenge for missions to the outer planets, requiring alternative means of spacecraft power generation that constrain available heater power as environments get colder. Missions to Jupiter and beyond typically employ radioactive power sources, so their waste heat must be distributed around the satellite by the thermal subsystem. Orbiting a planet presents further complications, in that each planet has its own albedo and infrared radiation characteristics as listed in Table 11-45B. For most spacecraft, heat balance on radiators is the dominant factor in the thermal design. Radiator location and coatings can be controlled, and MLI blankets are used to mimimize heat inputs and outputs for other surfaces. Since the maximum available radiator area is constrained by the structural size of the spacecraft, hot case scenarios must be assessed to ensure that sufficient radiator area is available to maintain acceptable temperatures. The first calculations should assess the amount of radiator area needed to reject the maximum operational heat load while maintaining gradients and component temperatures within their allowable operational mode range (including margin) in the hottest environmental conditions. Sometimes, radiator requirements exceed the available spacecraft surface area. Extended radiators (including deploy-ables) may be used, but they come with a mass penalty since they must be structurally supported and thermally coupled to the spacecraft. For simplicity, most mission scenarios are initially assumed to be a steady-state energy balance. Balance is achieved when all of the heat sources on a spacecraft are equal to the heat lost to space. Heat sources include external environmental inputs and internal heat generation, while the most significant heat losses are usually the controlled heat rejection from the radiators and heat leaks from MLI insulation and exposed structures. The heat balance for a typical spacecraft can be estimated as follows. where Qintemal ^ the internal spacecraft heat, q^aem^ is the external environmental heat load on the radiator per unit area, A is the area, £ is the radiator emittance, a is the Stefan-Boltzmann constant (5.670 51 x 10 "8 W/m^4), and T is the radiator temperature. where qjoiflr is the absorbed solar load per unit area, is the absorbed heat load . per unit area, qEarthlR's the absorbed Earth IR heat load per unit area, and q fackload¡s the radiative heat load from external spacecraft surfaces (solar arrays, antennas) that is absorbed on the radiator. where a and e are the absorptivity and emissivity of the radiator, IEIR and I^^ are the intensity of the Earth IR and solar fluxes, and Pajbedo 's the Earth's albedo. Suggested hot and cold case values for these parameters are shown in Table 11-48A. The remaining terms, FEIR and F^be^, are geometrical factors that account for the direction of the radiator relative to the Earth and Sun. (See Appendix D.2) Calculating the radiative backload from other spacecraft surfaces, qtackload' requires geometric modeling of the spacecraft that is beyond the scope of this discussion. Generally speaking, however, if the view that a surface has to space is blocked to a substantial degree by views to other spacecraft surfaces, this backload term can be so large as to make the surface useless as a radiator. For this reason, radiators are usually located on surfaces that have a reasonably clear view to space. Obviously, the most efficient radiator surfaces are those that minimize the external loads represented by the constituent terms of omental- Radiator coatings are therefore critical to the thermal design; coatings with low solar absorptance minimize Sun and albedo input, and a high emittance is required to maximize radiation to space. Backload on the radiator can be minimized by relative location of radiators and external components, especially solar arrays. Low-Earth orbits generally allow use of orbit average flux values for heat balance calculations on internal components,since their orbit periods are short relative to the thermal time constant of the components. Early assessment should use worst-case parameters.